I had planned to watch the Jane Eyre Miniseries for the All About the Brontes Challenge but I already reviewed that back in 2007. No fun in that! Why not experience Jane Eyre in yet another medium? 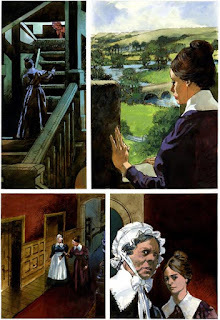 When I joined the Graphic Novels Challenge, I knew I wanted to read Jane Eyre: The Graphic Novel . So the decision was made! The artist John M Burns's panels are full color and realistically drawn. The people look like people not cutesy cartoon versions of humans. Although Jane is neither plain or small in these drawings, Burns doesn't shy away from representing Rochester as the broken shell of a man he is at the end of the novel. He's no Toby Stephens. Burns also manages to capture some of the gothic feel of the original. It would be rather difficult to squeeze all of Jane Eyre into 132 pages but Classics Comics gives it a good go. They seemed to have found all the good stuff, although at times I thought the transition from one panel to another jarring. I would think, "They left out blank part. This happened in between." But I guess that's why you have to read the original to get the full Jane Eyre experience. All the romance and gothic creepiness. Highly recommended and read Jane Eyre (the original) while you're at it. Thanks to my local library for the copy. Fun! I haven't read any classics adapted to graphic novel format yet, but this might be a good place to start. It looks as if the drawings would not annoy me (yay!) and it sounds like a lot of fun. Andi- It was fun and quick too. Will have to look for this! I've got a graphic adaptation of Pride & Prejudice here that is wonderful. JoAnn- Oh, I'll have to look for that! This looks like a lot of fun. I don't think anything could surpass the original, but I think I'd get a kick out of this. The illustrations look great. To the TBR list! Those drawings are fantastic! This looks like a great book. I love Janes Eyre, but didn't know about this! Off to see if my library has it! i have Frankenstein by the same publisher of this graphic novel but haven't read it yet. I need to just sit down and do it! I'm with BermudaOnion, the drawings look wonderful. Awesome review! I had no idea Jane Eyre was available in graphic novel form. I shall have to nab a copy. Fantastic artwork in this book. Do they show the madwoman in the attic? JS- Nothing's like the real thing but this was pretty good. Cathy & John- I was very impressed with the drawings. Stacy- Give it a shot. Aarti- It would give them a taste for it. Rebecca- I hope it would encourage them to read the original. When I was a kid, I read a bunch of Classics for Kids and it made me really want to read the real thing. Bookshelf- I'll have to look for that one too. Jill- You have my permission as long as you read the original right after. Bybee- Oh yes! She was quite spectacular. Oh no, I got all excited that I could read this instead of the original but I think I better stick to my plan and get the book from the library and not the GN adaption. IN fact, I wonder if there is an annotated - that sounds like fun? Interesting! I never considered looking for a graphic novel version of Jane Eyre -- I'll have to check this out. Thanks for the recommendation. I still have some Classics Comics from when I was a kid--they were the only comic books I liked except Archie! Love the illustrations in this; I'm going to have to look for it. I'm sure it can't even begin to top the original, but it looks like a fun read. I wasn't aware that there was a graphic novel adaptation. I can see how it might serve to entice young readers, it would probably be a nice companion to the novel. Great art work! I've never read a classic in a graphic novel medium, but it would be fun to explore a beloved novel in another way. I may have to check this out - thanks for the great review! I had no idea there was a graphic novel version of JE, so thank you for letting us know! :) Just ordered it from Amazon. I had no idea that there were graphic novels. Very interesting. I bet the younger generation loves it - bringing old classics to them in a new way! Sounds interesting.